This fall, i am taking Social Activism using Mobile Technology and for one of my first assignments is “to design (pencil, wireframe or working app!) a Cause-based mobile app, promoting a cause of your choice or invention”. Pixelrights will be a tool to battle NYPD’s policies of stop and frisk. It can also be a way to stop the harassment of people taking photos, a bi-product of September 11th overreach. The laws dictating photographer rights were a subject recently on WNYC’s On The Media and here is the ACLU’s take on it: if you are lawfully on public properly, you can photograph everything in plain view. In case you don’t know, New York City has waged a war against its black and hispanic male citizens. 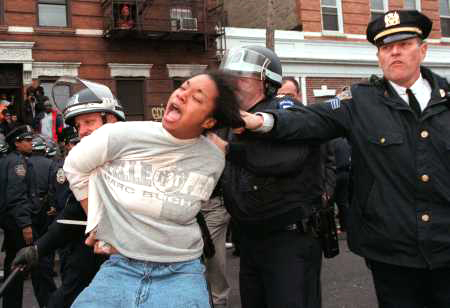 The nypd targets them in a systematic racial profiling tactic called stop and frisk. Read about it here in the nytimes, and how they have joined the tactic with arresting people for possessing small amounts of marijuana. 85% of those stopped are either black or hispanic. However, there doesn’t seem to be much anger for this outside of those communities, and I think it is because people have not had this sort of incident hit home. The moment you are stopped for doing nothing but being, or are harassed for taking pictures on the subway, your entire relationship with the police change. In An already imbalanced power situation worsens with every subsequent interaction. After happened to me, i realized i didn’t know my rights to be in a space or to take pictures. i was naive to the tactics that law enforcement uses to disarm you and put them in an even more advantageous situation. This is where PixelRights comes in. First, this app would teach the user by having current information about what your rights are as a photographer in NYC and how to interact with the police. Second, with cameras being so ubiquitous in mobile tech, your phone should be able to preserve the incident by taking pictures of a police badge (to provide record of the officer) or a police car, and uploading it to a database. When the picture is taken, location metadata is included and adds to a database that shows the frequency and location of such incidents. This would be a crowd sourced resource for the community. There would also be a way to record the audio of the incident, and upload it to a server with a timestamp. With the timestamp there would be less doubt with tampering or alteration of the incident. To put a face on these injustices, there would be the ability to share your story. It is easy to lose sight of the people behind these numbers. I want to focus on media (PSA’s, lectures) that teaches the user what their rights are and how they can protect them. Media like Flex Your Rights videos on youtube, and current stories in the mainstream media would be available. Since i love to experiment with cutting edge techniques AND getting the most bang for the buck, I would want this to be an HTML5 app, and not a native app. The goal should be to create a tool that is platform agnostic and not susceptible to the whims of the apple store. I don’t know how it would be possible on IOS to access the camera or microphone through a webpage, so more research definitely needs to be done. Nathan Freitas wrote me great feedback and offered some interesting leads. http://openwatch.net/ and cop recorder are efforts that give the functionality of recording video and audio and uploading it to their database! The code is also open source. This is a great start. Again as Nathan pointed out, PixelRights could be “a simple cheatsheet type app with 1-2-3 guides, videos and a directory of legal aide phone numbers to call”. It would help before a demonstration to review these facts. Alexis Madrigal of the Atlantic wrote about the origin of the open watch project this summer, and also describes the value of the app to collect data. As per Nathan’s suggestion, i would develop PixelRights to be an educational tool with up to date information for NYC citizens targeted by the police.